Having been in the reconnaissance business myself, I have a special fondness for ‘recce’ aircraft. Some time after Academy released their 1/48 scale Mk XIV Spitfires, I ran across an excellent walk around of the Swedish S-31 (PR XIX) in the IPMS Stockholm web site archives, and I was off! Then, one of my local model geek buds found out I was thinking about doing the PR XIX, and he ‘steered’ me to one of the aircraft used by (then) Flt/Lt Ed Powles. During construction, Wally also arranged for me to have a conversation with Mr. Powles; what a kick in the pants to speak with the man who flew the exact airplane you’re building! Flt/Lt Ed Powles led a two-plane detachment from 81 (PR) Squadron, based in Hong Kong in the early 1950’s. His exploits included some early cold-war aerial reconnaissance, as well as taking some of the first meteorological measurements at altitude in that region of the world. And then there was the time he took his PR XIX up to 51,000 ft. Noting a problem with the cabin pressurization, he put the nose down- and darn near went supersonic during the ensuing plunge back toward the sea. He later calculated that he got up to at least .96 Mach before regaining use of his flight controls in the denser lower air (having encountered locked controls due to compressibility near Mach 1), and levelled out approximately 1,500 ft above the sea. To top it off, Mr. Powles is over 6 feet tall and barely fit into the Spitfire with the seat fully lowered. What a great story! 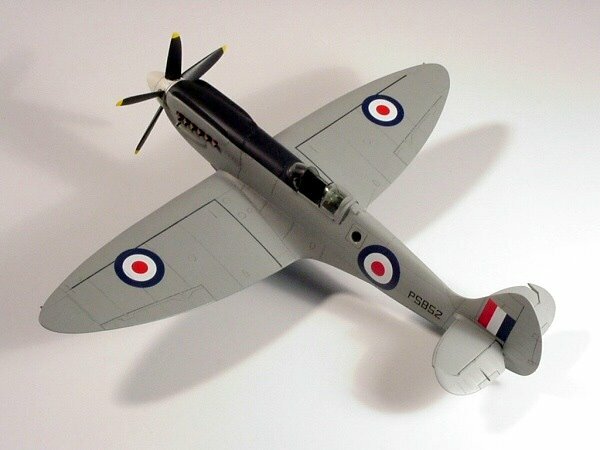 Academy produced two Mk XIV Spitfire kits, including both the ‘c’ winged version and the later bubble-canopied one with the ‘e’ wing, in 1/48 scale. 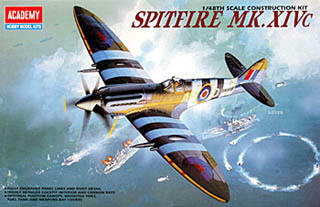 The Mk XIVc kit became the basis for this project. The Academy kits build up pretty well and feature fine panel line engraving. It has some accuracy issues which will be described below. The interior detail is rather Spartan for my taste, and the propeller looks rather bad. Parts fit is fair, but this isn’t a ‘shake ‘n bake’ kit. KMC produced a nice resin upgrade set for this kit, and while it’s currently discontinued, it can be found. It provides a complete cockpit, new spinner and props (which is also available as a separate set, I believe), a new upper engine cowling, and new radiators, much of which I made use of to great effect. Converting the Mk XIV into a PR XIX proved to be deceptively non-simple! First, let’s address the accuracy issues. While the wings in the Academy kit are especially nice in shape, they are rather thick. I have also come to the conclusion, along with some Spitfire experts, that the fuselage is a bit deep. The spinner and prop require some real work. 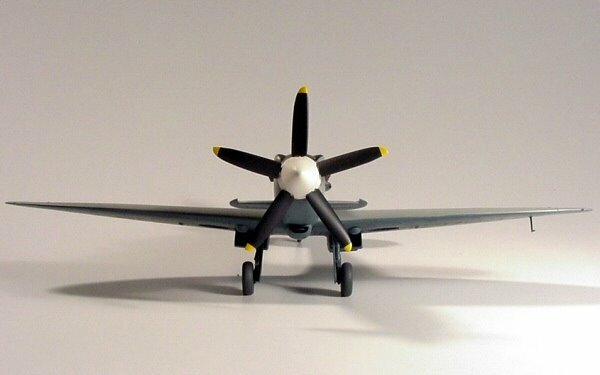 Broadly speaking, the spinner is too large and the propeller blades have the wrong shape. In my opinion, the dimensional errors with wings and fuselage would be a very difficult thing to fix. I limited myself to sanding down the forward nose area somewhat on the top and bottom during construction. The spinner/propeller areas can be corrected by sanding. The conversion procedure was as follows. Using references, I marked and scribed camera access panels onto each fuselage side. The left one also got a camera port drilled out. The standard pilot’s entry hatch was glued into place and the seams filled in. Only the first couple of dozen (give or take) Mk. XIX aircraft were built with unpressurized cockpits and featured the standard Spitfire pilot entry hatch on the left side. Eliminating the access door only applies to pressurized aircraft, like the one I modelled. New cabin pressurization scoop was fabricated, to go below the left engine exhaust pipes. Again, if you build a PR XIX from during WWII, check your references to see if you need to add this scoop or not. The rear, fixed portion of the canopy on the Academy kit is too short from front to back and must be replaced. In addition, this piece extended down about 2′ lower than normal Spitfires. I cut the rear area down even with the sliding section canopy sills, made a master, and vac-formed a new rear section. I glued this piece in place, smoothed the joins, and simply painted the horizontal frames in their correct location during painting. Solid pressure bulkhead at the rear of the cockpit was added. Again, this feature applies if if you’re doing a pressurized bird. I also decided to add some camera details since they are visible through the ports. I made a second bulkhead for the back of the camera bay, a rough approximation of the camera bodies, then added lens tubes using 1/8′ plastic tubing (approximating the 6′ width of these lenses). Here’s how they looked after finishing. This is not very accurate, but they look great through the camera ports! Also note the three oxygen bottles used in the XIX mounted to the front bulkhead. The kit’s windscreen had to be replaced with a one-piece curved unit. One of the Falcon conversion sets has one, and Aeroclub makes a set of four Spitfire canopies for different marks, including a PR. When I test-fit this piece, the leading edge sits back farther than the standard kit piece, and the round shape of the bottom of the piece doesn’t fit the kit. I added some sheet plastic to the front of the cockpit and shaped it to fit the new windscreen. 7. Using references, mark and drill out the two lower camera ports; note that they are offset slightly from the centreline of the aircraft. Mine are 3/16′ diameter.